The Holy Monk-Martyr and Confessor Stephen the New was born in 715 at Constantinople into a pious Christian family. His parents, having two daughters, prayed the Lord for the birth of a son. The mother of the newborn Stephen took him to the Blachernae church in honour of the Most Holy Mother of God and dedicated him to God. During the time of the emperor Leo the Isaurian (716-741) there began persecution against holy icons and against those venerating them. With the support of the emperor, the adherents of the Iconoclast heresy seized control of the supreme positions of authority in the empire and in the Church. Persecuted by the powers of this world, Orthodoxy was preserved in monasteries distant from the capital, in solitary cells and in the brave and faithful hearts of its followers. The Orthodox parents of Saint Stephen, grieved by the surrounding impiety, fled from Constantinople to Bithynia, and they gave over their sixteen year old son in obedience to Blessed John, who asceticised in a solitary place on the Mount of Saint Auxentios. Saint Stephen dwelt more than fifteen years with Blessed John, having devoted himself totally to this spirit-bearing elder, and learning monastic activity from him. Here then Stephen received the news that his father was dead, and his mother and sisters had taken monastic tonsure. After a certain while his teacher, Blessed John, also died. With deep sorrow Saint Stephen buried his venerable body, and by himself continued with monastic effort in his cave. Soon monks began to come to the ascetic, desiring to learn from him the virtuous and salvific life, and there gradually emerged a monastery, the hegumen of which was Saint Stephen. At forty-two years of age Stephen left the monastery founded by him, and he went to another mountain, on the summit of which he dwelt in deep seclusion in a solitary cell. But here also soon gathered a community of monks, seeking the spiritual guidance of Saint Stephen. 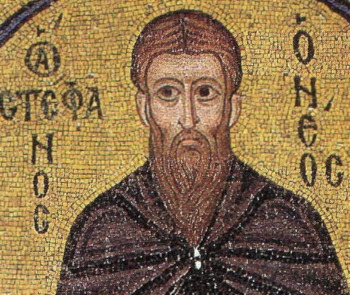 Leo the Isaurian was succeeded by Constantine Copronymos (741-775), a still more fierce persecutor of the Orthodox pious, and still more zealous an iconoclast. The emperor convened an Iconoclast council, to which came 358 bishops from the Eastern provinces. However, except for the archbishop of Constantinople Constantine – illegitimately raised up onto the patriarchal throne by the power of Copronymos – not one of the other patriarchs bothered to participate in the wicked doings of this council, thus making it all the less able to usurp the term “ecumenical.” This council of heretics, at the instigation of the emperor and the archbishop, described icons as idols, and proscribed anathema on all who venerate icons in the Orthodox manner, and it described icon veneration as heresy. Meanwhile, the monastery of Saint Stephen and its hegumen became known of in the capital. They told the emperor about the ascetic life of the monks, about their Orthodox piety, about the gift of wonderworking of the hegumen Stephen, and about how the news of Saint Stephen had spread far beyond the region of the monastery, and that the name of its head was accorded universal respect and love. The open encouragement of icon-veneration and therein the rebuff to the persecutors of Orthodoxy within the monastery of Saint Stephen especially angered the emperor. Archbishop Constantine perceived, that in the person of Saint Stephen he had a strong and implacable opponent to his iconoclastic intentions, and he took great efforts that he might draw him over to his side or else destroy him. They tried to entice Saint Stephen into the Iconoclast camp, at first with flattery and bribery, then by threats, but in vain. Then they slandered the saint, accusing him of co-habiting with nuns. But his guilt was not proven, since the slandered nun courageously denied guilt and died under torture and beatings. Finally, the emperor gave orders to lock up the saint in prison, and to destroy his monastery. Iconoclast bishops were sent to Saint Stephen in prison, trying to persuade him of the dogmatic correctness of the Iconoclast position. But the saint easily refuted all the arguments of the heretics and he remained true to Orthodoxy. Then the emperor gave orders to exile the saint to one of the islands in the Sea of Marmora. The monk settled into a cave, and there also soon gathered his disciples. After a certain while the saint left the brethren and took upon himself the exploit of pillar-dweller. News about the Pillar-Dweller Stephen, and about the miracles worked by his prayers, spread throughout all the empire and strengthened the faith and spirit of Orthodoxy in the people. The emperor gave orders to transfer Saint Stephen to prison on the island of Pharos, and then to bring him to trial. At the trial, the saint refuted the arguments of the heretics sitting in judgement upon him. He explained the dogmatic essence of icon‑veneration, and he denounced the Iconoclasts for this – that in blaspheming icons, they gave blasphemy to Christ and the Mother of God. The saint pointed to a golden coin in proof, upon which was the depiction of the emperor. He asked the judges, what they would do with a man, who having thrown down the money, would then trample it under his feet. They answered him, that such a man would certainly be punished for having dishonoured the image of the emperor. To this the saint said, that an even greater punishment awaited anyone who would dishonour the image of the King of Heaven and His Saints, and with that he cast down the coin upon the ground and began to grind it underfoot. The emperor gave orders to take away the saint to prison, where already there were languishing 342 elders, condemned for the veneration of icons. And in this prison Saint Stephen spent eleven months, consoling the imprisoned. Together with them he made the singing of prayer, often doing the tropar to the Image of the Saviour Not‑Wrought-by-Hands. The people in crowds came to the prison and asked Saint Stephen to pray for them. The emperor, having learned that in prison the saint had organised a monastery, where constantly there was prayer amidst which they venerated holy icons, sent two of his own dearest servants, twin brothers, to beat the saint to death. When these brothers went to the prison and beheld the face of the monk shining with a Divine light, they fell down on their knees to him, asking his forgiveness and prayers, but they told the emperor that his command had been carried out. But the emperor learned the truth and he resorted to still another lie. Informing his soldiers, that the saint had intentions to topple him from the throne, he dispatched them to the prison. The holy confessor himself came out half the way to the furious soldiers, who seized hold of him and dragged him through the streets of the city. They then threw the lacerated body of the martyr into a pit, where they were wont to bury criminals. On the following morning over Mount Auxentios there appeared a fiery cloud, and then an heavy darkness descended upon the capital with a fierce thunderstorm.